Three Billboards Outside of Ebbing, Missouri has an Oscar Wilde joke figure prominently in the plot. And then there is the issue of moderates/centrists almost being homeless within the Democratic Party. It is starkly apparent in The Hive. No thanks. Sorry. What is it that Graham wants???? A section of a yet to be published report to contain something unrelated to the investigation???? Without knowing what is in the report (it could make comment on Graham's concern) he wants to edit it. I think that Lindsey should just write a report himself. let all Republicans vote for transparency. Makes us all look good and doesn’t matter. Doesn't matter? Then why mention it? Donald Trump lies all the time about everything. 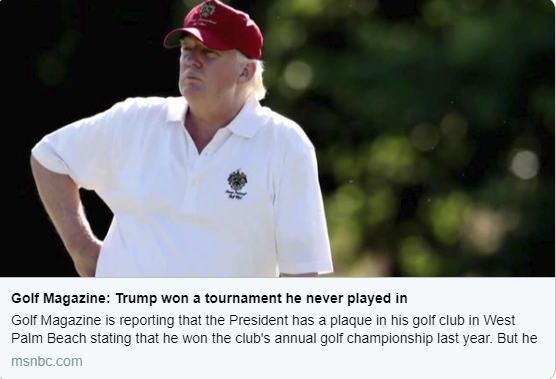 @realDonaldTrump It was a rerun, idiot. Some of us can only get away twice a year. And we want to share a most sublime pastime with our kids and buddies. Harrumph! Then you're not the type of person I mean. You're "serious" in that sense, just too busy. I fished a lot when I had a day job. Now I'm a freelancer and I barely fish at all. So again, a thousand pardons if you thought you were meant, because you weren't. World class cynicism. He cheapens us. Hmmm, I didn't check a book of quotes so you might be right. Here's another quote that might not be verbatim but I believe is accurate. You're about as subtle as an elephant's prick. I think Ed Sullivan said that about Don Rickels. Trump was practically sitting on his hands when they asked him about the NZ shooter, to keep from making his own favorite hand gesture. I wonder how long he can keep it up. Whats the deal with Carter Page and Felix Sater? does anyone seriously believe Mueller is going to end his probe without either of those guys getting indicted? My guess is Sater is part of the reason Andrew Weissman left the probe (https://slate.com/news-and-politics/2017/06/felix-sater-donald-trump-robert-mueller-and-andrew-weissmann.html) if/when Sater is revealed as rat and inside informant all along when the whole gang gets indicted, Mueller needed to have the prior entanglement of Weissman and Sater put to bed. I know I'm late to the party, but I believe he did tell them to vote for it. I can't believe there's any other way 185 or so Rs voted with Ds on ANYTHING, much less something like this. I also believe he did it just so he could say this. Is that the game with the "go directly to jail" card? Well, it was Oscar Wilde. Could well have been true for him. I’m not contesting whether he said it, I’m arguing the factuality of it! Native Houstonian here... I can attest to this!